We have focused on Shetland cod. You won’t believe how good the quality is and how big and meaty these flakes are! Ask yourself, is my fish supplier getting me cod this good 6 days a week? There are also a few examples of our specials for this week that can smash your GP targets, as well as another recipe if you’re stuck for that bit of weekend inspiration. Sailbrand is committed to being the number one supplier for quality in the North, it’s our passion and our pride in what we do that sets us apart. Put it to the test this week and you won’t be disappointed. The best fish and seafood direct from the coast to your kitchen! Here at Sailbrand We have a wide range of Fresh Whole Fish available in our shop and also for delivery tomorrow. 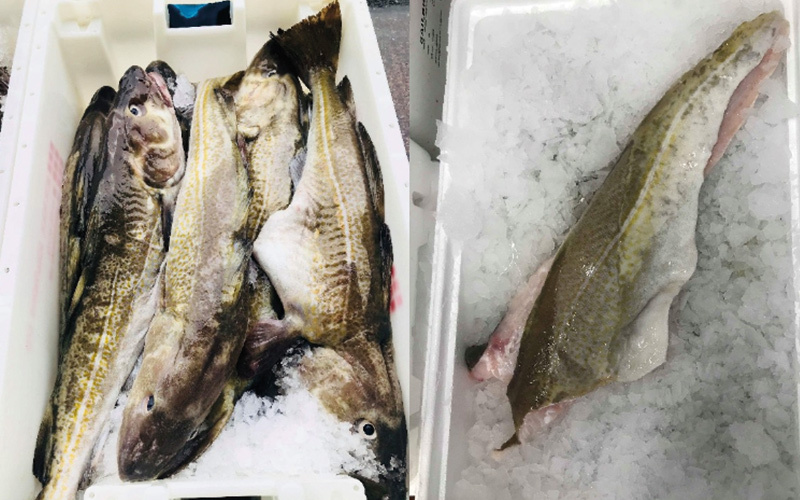 Below are some of the Fresh Fish we have available, we also have much much more so please call us on 01484 548975 to see what you can put on your special boards this weekend. What’s on Specials This Week? Here is a tiny selection of the amazing fresh shellfish we have to offer at consistently low prices, can your supplier beat this? staggering! As our main man, Lee would say: it’s crystal! 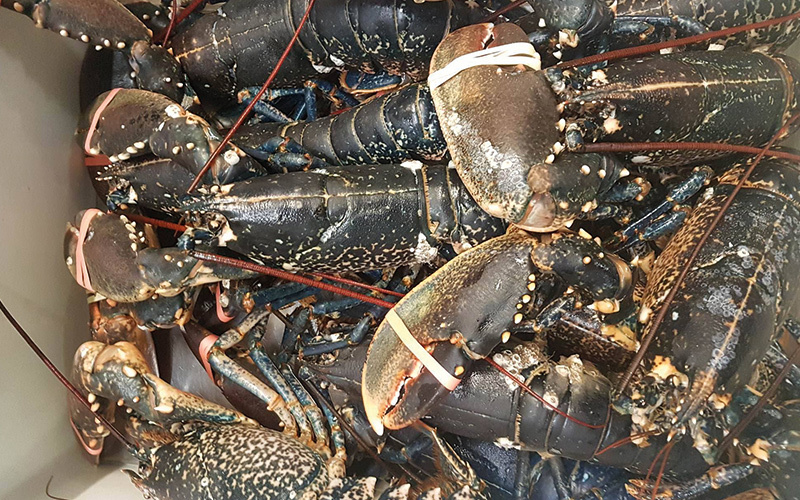 Coming to us daily from Shetland, we can supply any size, any prep of this beautiful firm, white-fleshed favourite so whether it’s a staple menu item or you just need a GP busting ingredient for this weekend’s specials, look no further, give us a call. There’s also a great recipe at the bottom of the page if you’re stuck for a bit of inspiration. Follow this link to get your hands on a really great little tool that will help ensure you smash your targets month after month. You can put in the cost price of your fish, shellfish, or any other product and it will give you the correct cost price you need, whatever GP% you are looking for. Download it today and give it a try. This dish is a show stopper! Full of colours and textures this is sure to wow your customers. 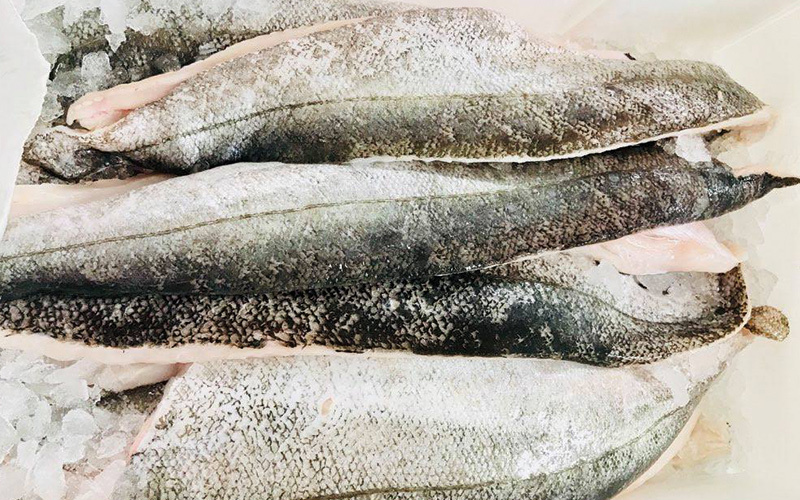 Call the office today to talk about our stunning Shetland Cod and discuss your prep requirements. The purple potatoes and salty fingers are available most of the year from good veg stockists. 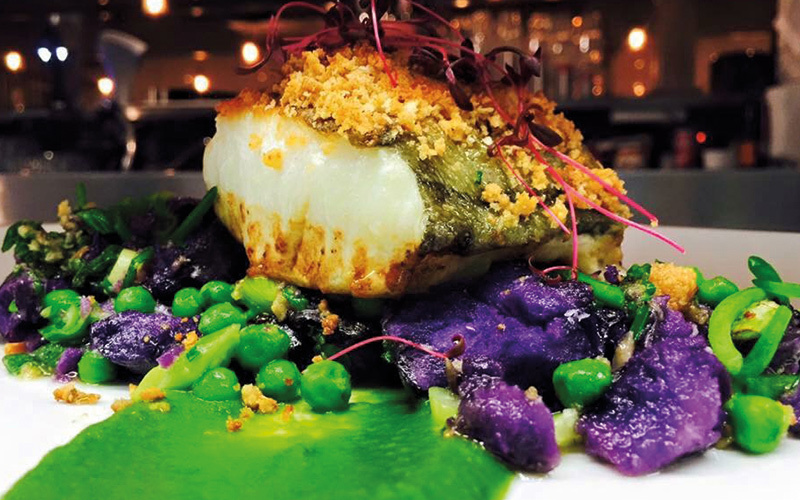 For the herb crust, combine the herbs, breadcrumbs and butter in a food processor until workable, then transfer on to the skin side of the cod. Boil the purple potatoes then season and crush lightly with a fork, then toss through the peas and check the seasoning again. Keep to one side for plating up. Roast the fish in a hot oven for 8 minutes, until just cooked, then place on top of the crushed potato and pea mixture, dotting the salty fingers in and around to provide a salty taste and crunchy texture.